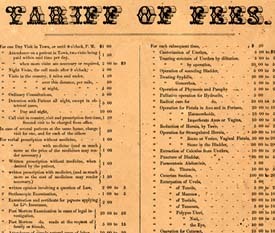 Rowan County Medical Society Tariff of Fees. Medical care, Cost of -- North Carolina -- Rowan County. Medical fees -- North Carolina -- Rowan County. Medicine -- North Carolina -- Rowan County. Physicians -- North Carolina -- Rowan County -- Discipline. Rowan County (N.C.) -- History.